The story follows Karen Kohiruimaki, a 183-centimeter-tall (6-foot-tall) college student who's insecure about her height, and is bad at dealing with people in the real world. 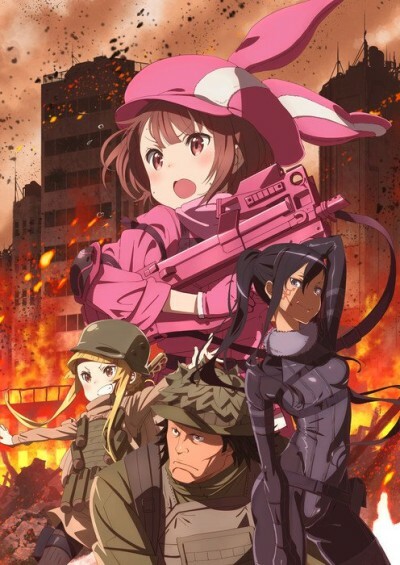 She enters the world of Gun Gale Online with her avatar, Ren, who is less than 150 centimeters (5 feet) tall and wears all pink. She meets a beautiful, brown-skinned female player who goes by Pitohui. They hit it off, but one day Pitohui pressures her to participate in "Squad Jam," a team battle royale variation of the Bullet of Bullets tournament. A really fun show about a pink loli killing grown men in a video game. Initially enjoyable, but becomes quite a mess later on. OSTs are great though.